We had our new floors laid a few weeks ago and before that we had to take all the doors off their hinges and trim them to make sure that the would open over the new floor. 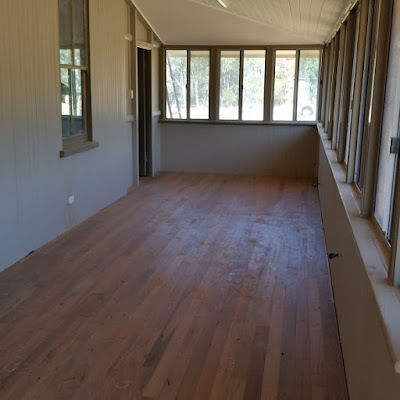 If you just want to see what our new ironbark hardwood floor looks like, skip to the end. I searched the internet for clever ideas for trimming doors and there is a special power tool you can buy called a "door trimmer" (of course), but it doesn't seem to be common in Australia and we didn't want to buy another power tool just to do one job (it looks like you can hire them in other countries). It does look like it would be very useful if you had a lot of doors to trim, something a builder might invest in. Without a door trimmer, our only other option was to take each door off its hinges, trim it and rehang it. We were not really keen on removing hundred year old doors, but we had no choice. Luckily it was easier than expected. First Pete cleaned the paint off each hinge using a wire wheel on an angle grinder. This made it easier to get to the screws, which he then removed with a battery powered drill. I helped to carry the doors into the lounge where we had two saw horses to sit the door on. Pete marked the bottom of the doors (we decided to trim each door by 10mm to ensure that they would open over the new floor, even if the house moves slightly). Pete then clamped a piece of metal flat section to the bottom of the door to use as a cutting guide, and a circular saw to trim the bottom of the door. Then I helped to carry the door back to where it came from and held it straight while Pete screwed the hinges back in. We found that some doors had bits of cardboard used as packing, which we replaced with new cardboard to keep the door square. All of the doors looked better after being trimmed. One door in particular has a frame that is completely out of square and there was nothing we could do about it, but that's the joys of working on an old house! When we were finished I called the floor people, and let them know that we were nearly ready. We had left a deposit six months ago and they were waiting for us to confirm our installation date. I was very surprised when they said they could come the following week! We rushed to finish painting the window frames and doors in Dulux "Light Leather". Even though they looked lovely in the white primer, I knew that it would be impossible to keep them white, so practicality won and we painted them a mid-brown colour. I like the way it frames the view of trees outside. The new floors are 10mm thick ironbark "tongue and groove" boards laid over the existing hoop pine. 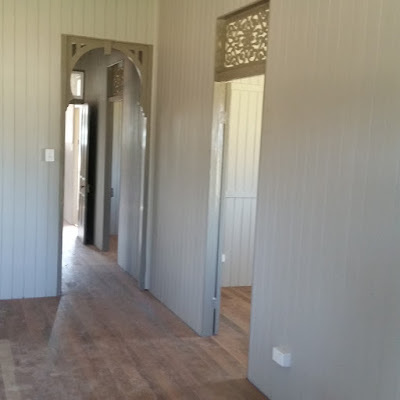 We looked at having the hoop pine sanded, however it was never designed to be walked on, being a soft timber, they have always been covered with rugs, carpet or lino. The boards had big gaps in them (you could see the ground through some of the gaps!) which would have been a lot of work to fill. We thought about tiles, but they are better suited to concrete slabs, not wooden houses on stumps that shift (we have tiles in the bathroom and laundry only, just small rooms). We are not fans of carpet (I HATE vacuuming) or lino (plastic! ), but when we found out that we could get hardwood floorboards (not "engineered", but natural wood boards), we thought that was a really good option for this house. The wood boards will move with the house. The colours in the wood suit the house and environment outside the windows. The additional layer of floor will add insulation and it has definitely strengthened the floor (footsteps at one end of the house can no longer be felt at the other end of the house). We can re-sand and polish the wood at any time. Speaking of sanding, the boards are yet to be sanded and polished. We have chosen a penetrating wax rather than a lacquer product. If the floor gets scratched we can just sand back a small patch and re-polish it, which is pretty difficult to do with a lacquer. The floors will be finished as soon as the skirting boards and kitchen are done. Unfortunately our chosen kitchen maker is very busy, so this might be early next year (he is very highly recommended, so worth the wait I hope). What do you think? 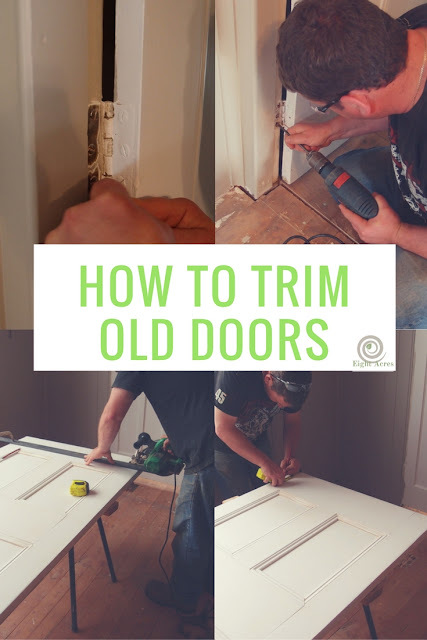 Have you even tried to trim old doors? Have you had a new floor laid? That is frustrating! I recommend the house removal company that we used - Burnett House Removals. They also do restumping, very professional and best tradesman we've dealt with so far. Gosh I love that side room - what direction is its aspect...shade or sun? I like the trim colour. I have a 'door trimmer' Liz, I just can't get him started. ;-) Seriously though we do have a door that needs to be taken off its hinges and trimmed so the final piece of floor edging that needs to be installed under the existing door can be put in place. That job is on the list. I love the way your home is coming together and I really enjoy reading the updates. A common job for me I'm afraid! One of thsoe jobs where it can go easy or be a right pain. I do it in much the same way only have a fancier saw!